As the 2011 holiday season is officially over we can begin summarize the busiest time of the year for online retailers. We already knew it is going to be tremendously heavy sales season already when Thanksgiving and Black Friday produced a big jump in sales, following by the breaking records Cyber Monday and afterwards Green Monday that became the third highest spending day ever. Today, comScore released its latest online spending report and it is now safe to announce that it was the highest online spending season ever with nearly $35.3 billion in online spending between November 1st to December 26th, which represent a 15.3% increase from last year holiday season old record. The report is indicating about an interesting phenomena on Christmas day- digital content sales that usually responsible for 2.8% of the total retail daily sales during the holiday season, has peaked on Christmas day and was responsible for more than 20% of the total retail sales. This attributed to the surging mobile industry where many people spend money on mobile contents for their smartphone and/or a tablet. 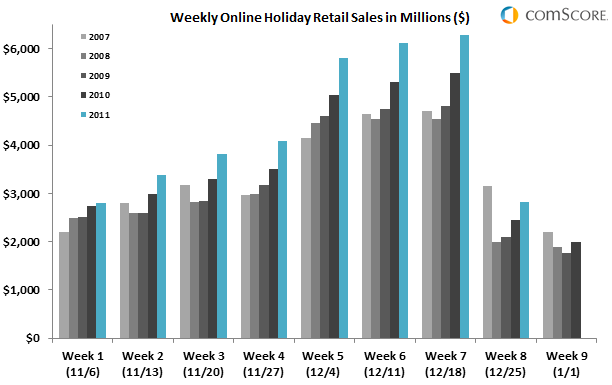 Last week (December 19th to December 25th) has produced $2.8 billion in spending, 15.6% increase compared to last year, however, still a little behind the parallel week in 2007 which holds the record of generating slightly more than $3 billion in online spending. This is the only week among all 2011 holiday season weeks that didn’t broke prior years records.